The New Testament is rich with profound stories of Jesus as He lived among us. Interestingly enough, most of these stories aren't about Jesus' miracles to the masses. The most powerful descriptions of His touch aren't to the entire state of the Jewish people or the Roman guard, or to the thousands that followed Him into the hills. The greatest stories about Jesus are the personal ones. Because Jesus is a personal savior. Jesus sought out Philip. Nathaniel. Matthew. Jesus healed the lame man. The official's son. The blind man. The leper. The paraplegic. Jesus conversed with Nicodemus. The Samaritan Woman. Mary. Martha. The Roman Officer. The Rich Young Ruler. Jesus redeemed the adulterous woman. The demon possessed man. The thief on the cross. Jesus washed each of His disciples' feet. Though He had power over all things created, though heaven waited on Him, and angels served Him, Jesus did not perform for the masses. He did not heal the hundreds by a word, or call the disciples by a group. Jesus reached out to each person--one at a time. It is a profound, yet obvious revelation because if Jesus is the only one who had the power and authority to perform ground shaking, earth shattering, high scale impact, and yet did not, on what do we base our own belief that we must change the world on only a grand scale? Where, when, why, and how did we lose sight of what Jesus did? Why don't we believe that, just like Jesus, we too can change the world by reaching out and impacting one life at a time? In Christian circles today we like to speak of "good works" of the faith. Things like missions trips to Brazil, Kazakhstan, India, or Tibet. Things like preaching sermons to a congregation of 10,000 or calling 300 people to salvation. We like to talk about a newly published work on faith making the bestsellers list, or the latest Christian movie that made 10 million dollars on opening weekend. When did we forget Jesus' words, "If you give a cup of cold water to one of the least of these brothers, you will surely be rewarded?" We forget because giving a cup of cold water garners no praise and impresses neither others nor ourselves. We forget because giving a cup of cold water is something anyone can do. And that is precisely why we do not. But Jesus gives a cup of water...to individuals. In Jesus' prayer from John 17, he says, "I have finished the work you have given me...I have not lost one." Jesus spoke His words of life before His death on the cross. Jesus lived, breathed, and walked on this earth to show us true love. He demonstrated that changing the world happens not because we affect thousands. We change the world because we reach out to the individuals around us, show them that we care, and give to them when they need it most. Go further today. It doesn't take much to change a life. An hour conversing over coffee. A small gift for no particular reason. A phone call. A hug of encouragement. A basket of flowers. A second chance. An old photograph. A post office mailed letter. An extra 10 minutes in a greeting to ask how someone is really doing. Praying for someone the moment they mention a prayer request. May each one of us remember this: Through impacting one life at a time, we just might change the world for Jesus. Christina Dickson is a photo journalist from Portland, Oregon. At 21, she is director and founder of Revolutionary Media, a non-profit artistic media group dedicated to creating media projects that will cause believers to reach out and "rescue the beauty." Visit Revolutionary Media's blog at http://www.therevmediaproject.blogspot.com/ or visit Christina's personal photography business blog at http://christinanicholephotography.com/. 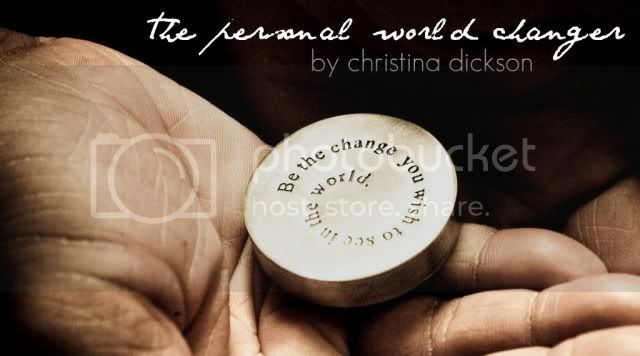 Photo Credit: Christina Dickson -- Originally posted in November 2009.
very inspiring?? it is hard to stay faithful with even the little things and to be more focused on the world as a whole.